Another central agency changes hands as James Nason at Fraser Yachts says he's taken over the sales listing of the classic 35.4m motor yacht Quivira and she's had a price cut. Built by Benetti in 1979 and benefitting from an extensive refit in 2008, this superyacht's warm mahogany interior by Bard Design Group accommodates 10 guests in a master, two double and two twin cabins. Quivira has a range of 2,000 nautical miles at her cruising speed of 10 knots and has proven her worth as a very popular charter superyacht. 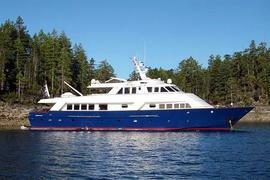 Her asking price has come down from $4.8 million to $3.995 million.